Less than intuitive user interface, although I was able to overcome it with frequent use. Use of this product (and similar ones, I imagine) requires a lot of time – time that I would rather spend researching. I can use the Legacy “copy clipboard” feature in a fraction of the time that it takes me to enter a document record into Clooz and then export it into Legacy. I have a pretty robust system for naming and filing electronic documents. I can generally find and open a document without the need of Clooz. I really wanted to like Clooz. I just wasn’t getting much value out of it relative to the time I was spending using it. I’ve started using Clooz as my data entry tool for Swedish Household Examination records. Why? First of all, I’ve discovered that while Legacy is a great program for storing genealogical facts, there are many documents in my collection that are directly related to my family history but that don’t necessarily contain discrete genealogical facts. So Clooz is the tool I use to maintain a database warehouse for these documents. Until recently, Legacy did not allow a single document (a census record, for example) to be attached to more than one individual. You had to copy the source and manually paste it to everyone included in the census record. Recently, Legacy introduced “Shared Events” for this purpose, but I’ve found that Shared Events are not compatible with my TNG installation . This makes me wonder whether Shared Events would be compatible with other tools that accept GEDCOM import. So I think I’m better off sticking to a plain-vanilla data structure. 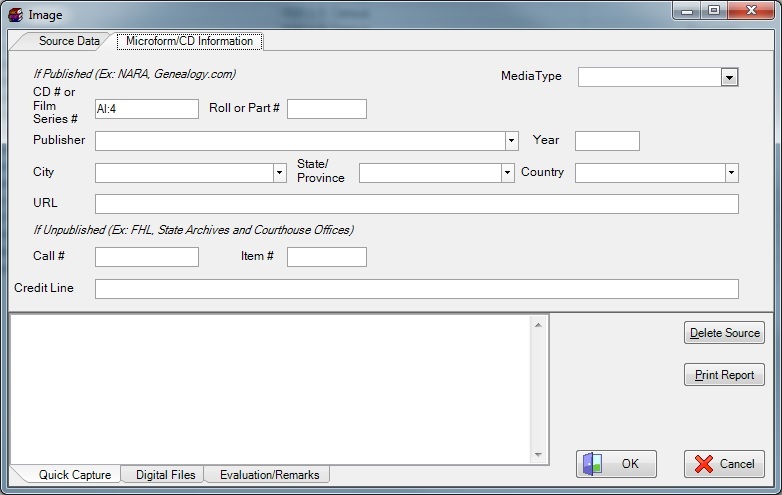 If you enter a census record in Clooz, you can link it to more than one individual and then export it to Legacy. This has the same result as a Shared Event plus the added bonus of having the census record stored in your Clooz database along with all your other documents. Swedish Household Examination records are very much like census records, and Clooz has the ability to handle “generic” census records such as these. In fact, the “generic” concept is ideal since the Household Exam records can be wildly different depending on the date of the record and the parish pastor’s own idiosyncrasies. By fine-tuning the way I set up my Repository, Source and Document records in Clooz, I am able to do Household Exam data entry quite efficiently and end up with well-sourced Events in Legacy that also play nicely with TNG. 1. 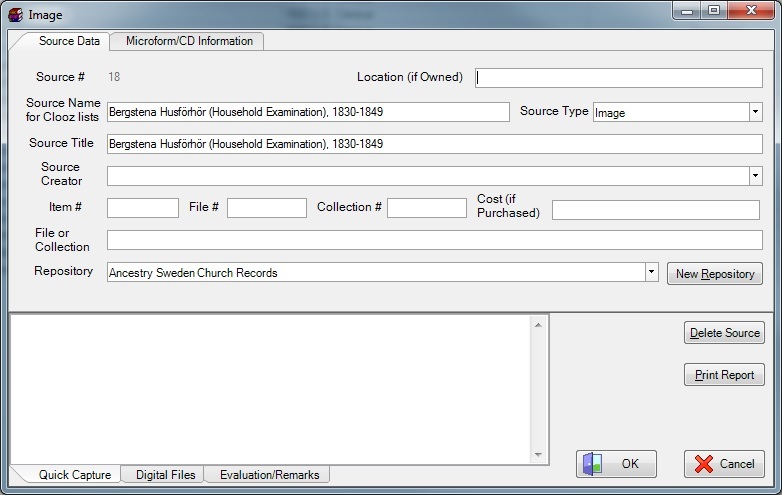 In Clooz, create a Repository for all Swedish Church Records. I am getting my record imagess from Ancestry, so I am just referencing the URL to the main search page for all Swedish Church Records. I have opted not to archive URL links for each individual document record because I doubt those links will be stable over the long haul. Something to keep in mind when using Clooz: just because boxes are available to you on a particular form doesn’t mean that you have to attempt to use them all! Think of them as options or suggestions. 2. Next, create a Document Source that is unique to Household Examination records for a single date range for a single parish. In Clooz under “Sources”, select “Image”. then complete the form as shown below. Complete the Source Name and Source Title to show the parish name, the type of records and the year span. 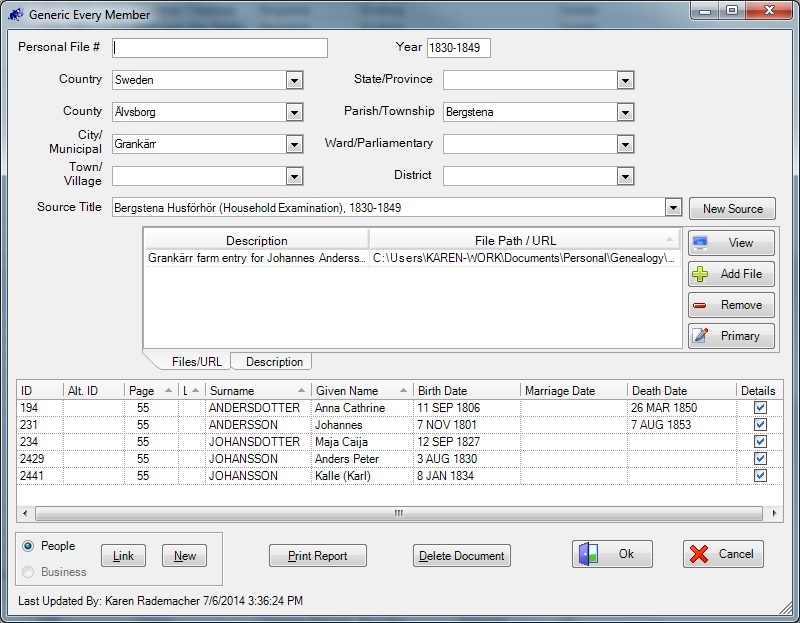 Select the Repository for your Swedish Church Records. On the Microform/CD Information tab, put the film series number in the appropriate box as shown. 3. Now enter a Household Examination record as a “Generic Every Member” census form under the All Censuses menu. On the detail for each linked person, complete the page number to correspond to the page number in the actual record (use image number if the page is unnumbered). Also complete the “relationship” box. Finally, write some narrative or a transcription in the “Remarks” box. This will show up nicely in Legacy reports. Now it’s time to export the record to Legacy. Take a moment to double-check everything – you’re entering a lot of data at once in the next step, and you don’t want to have to un-do! Click “Export” and you’re done! Visit the corresponding individuals in your Legacy file to confirm that everything came in the way you expected. Bergstena Husförhör (Household Examination), 1830-1849 (digital series AI:3), Grankärr, Älvsborg, Page 55. 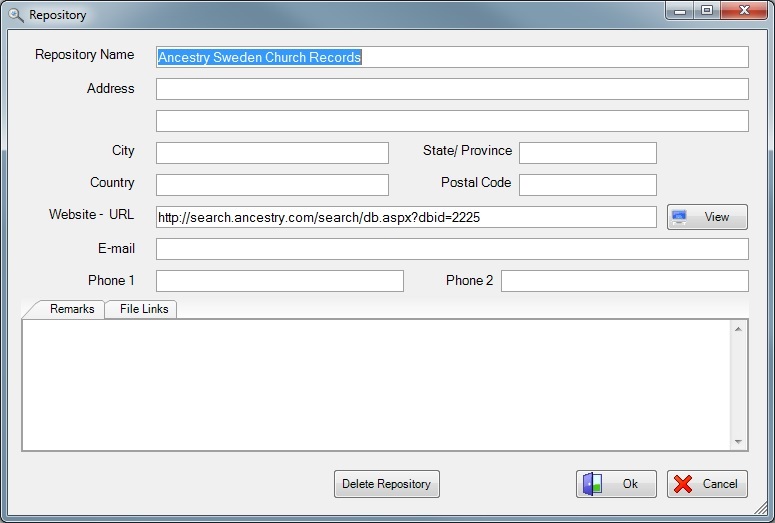 Repository: Ancestry Sweden Church Records, http://search.ancestry.com/search/db.aspx?dbid=2225.